Action from Deeping's win over Desborough (blue) at the Haydon Whitham Stadium. Photo: James Richardson. 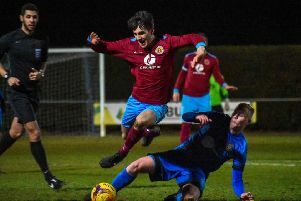 Deeping Rangers secured a 10th straight win in the United Counties Premier Division last night (February 12) to move within four points of top spot. Dan Jarvis scored the winning goal in 2-1 success after opponents Desborough had equalised Cameron Johnson’s first-half strike at the Haydon Whitham Stadium. Dan Jarvis scores the winning goal for Deeping Rangers against Desborough. Photo: James Richardson. Deeping retained second place as a result, but closed the gap again on long-time leaders Daventry ahead of a tough game on Saturday at fifth-placed Pinchbeck. Fourth-placed Holbeach United came from behind to win 2-1 at 10-man Eynesbury Rovers and maintain new manager Dan Hussey’s 100 per cent winning record. Billy Smith and Joe Braithwaite scored the goals for the Tigers both after the home side had suffered a first-half red card. Holbeach have now won five matches in a row, but they are 12 points behind Deeping. 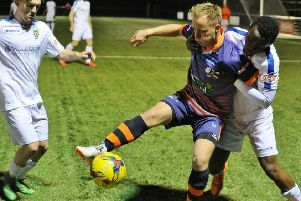 Yaxley, who now play at the Decker Bus Ltd Stadium after a new sponsorship deal was struck, made it 10 games without a win in Division One Central of the Evo Stik Southern League despite taking a first-minute lead through Tom Waumsley against Bedford Town. Deeping Rangers manager Michael Goode looks on as his side beat Desborough 2-1. Photo: James Richardson. The visitors equalised with a penalty and clinched a 2-1 win midway through the second half. Yaxley are nine points clear of the relegation zone, but have played more games than the bottom two. Previous ground sponsors In2itive Business Solution wil continue to support the club. Premier Division: Deeping Rangers 2 (Johnson, Jarvis), Desborough Town 1; Eynesbury Rovers 1, Holbeach United 2 (B. Smith, Braithwaite).